Mona Lisa Gherardini, is the only child of a wealthy wool merchant and his frail wife, Lucrezia. When her astrological charts are constructed, an ominous prophecy is foretold that Lisa does not understand at first, but that will have a tremendous impact on her life. 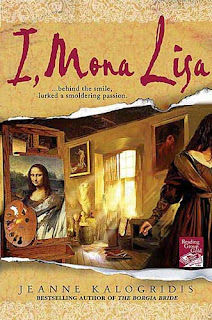 Lucrezia is somehow connected to the famous Lorenzo de Medici who rules Florence and is a decadent art collector and patron of Leonardo da Vinci and Michelangelo. A radical monk by the name Savonarola arrives in Venice and begins preaching against the sinful decadence of the de Medici family. Lisa's father becomes a dedicated follower of the monk and his preachings. When Lisa's mother, Lucrezia, dies a horrible death influenced by Savonarola, Lisa meets Lorenzo de Medici and is introduced to his handsome son, Giuliano. She also meets the mysterious, but charismatic Leonardo da Vinci. Unbeknownst to Lisa, both these men will have a profound impact on her life. As Savonarola rises to power, and Lorenzo de Medici meets his death, Florence is thrown into chaos and Lisa faces danger at every turn as she slowly discovers the dark secrets that haunt her past.